Enthusiastic food growers and community builders, Valerie Kausen and Gary Heine, have created 34 presentations to show you how growing your own food can change your life. This event is truly for everyone… because growing your own food contributes to improved health and connected community. It’s also an activity for the whole family that builds friendships in your neighborhood as you share each other’s skills and interests. Don’t let anyone else decide what’s in the food you eat! Change your life. Gain access to the information you need RIGHT NOW to optimize your health, connect with nature and those you love. It’s that simple. Learn how to grow and eat healthy, local food. Change your health and life, and that of your family, friends and neighbors. Feel satisfied that you can depend on yourself. Learn how growing your own food helps make your local community There are serious issues to address related to our health, our community and our planet. The answers begin in your backyard–growing your own food reduces toxicity, transportation and pollution, and gives you a trusted, sustainable source of nutrition and increased happiness. With over 34 total presenters sharing their wealth of knowledge, this invaluable (and FREE) resource is intended for you, whether you live in a city or on a farm! Come listen to the Grow Your Own Food Summit ONLINE for FREE and be inspired from July 7-14, 2014. Can you sew? Do you have new items bought for an occasion that you no longer need (baby items, books, personal items)? If you are interested in donating or working with garden club members on items for the hospital, please call Madalyn Hernandez at 972 226-2467 and leave a message. Become involved in YOUR world. Take a plant to a friend TODAY! The Sunnyvale Garden Club is starting a new community project. 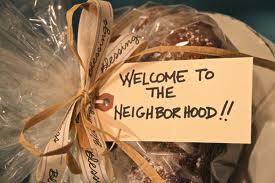 We will be providing “Welcome to Sunnyvale” baskets to new residents. It’s our way of letting them know that they have made the right decision in selecting Sunnyvale as their home! Any item (s) you can donate to fill the baskets will be very much appreciated. We need baskets, tissue paper, products, items, business cards, plants, ANYTHING! Invite your friends, neighbors, and relatives to donate. Your name and/or company can be indicated upon your request. You can drop off your items at 225 East Fork Road or arrange to have them picked up at your location. You can also bring your donations to the next summer symposium on June 10th.